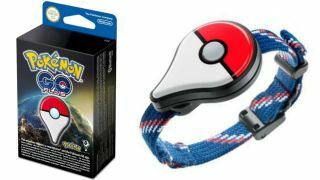 If you've always fancied a cheap Pokemon GO Plus bracelet Amazon Prime Day is here for you with a not insubstantial 57% off the usual price. That means you can pick up the Plus for a far friendlier £12.99 instead of the usual £29.99. Now, to be clear here: you need Pokemon Go on you phone as this only works with that - letting you catch Pokemon and spin stops with a press of its button, rather than getting your phone out. It's also a lightning deal so you've only got a few hours or until it sells out to grab it. The way it works it with a series of coloured flashes. If the button flashes green it means there's a Pokemon you've caught before in range. If it's yellow, it means its something you've not caught yet. Just press the button to automatically catch it and if it flashes lots of colours you were successful, if it flashes red it got away. It'll also flash blue when you're near a stop and again, just press it to do the business automatically. It's got a rumble function too so there's little chance of missing anything whether you clip it on somewhere or wear it using the included strap. And, if it's not your bag personally, it's a perfect present for the Pokemon trainer in you life. Maybe grab one now while it's cheap and save it for any birthdays on the horizon.